A primary determinant for the Fed’s decision to raise rates is inflation. As part of its monetary policy objectives, the Fed had set a 2% target for consumer inflation as a trigger for sustained rate increases. 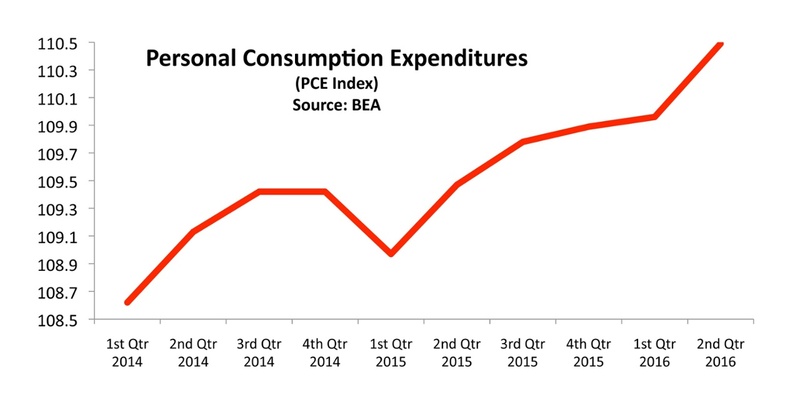 A closely followed indicator of inflation and what consumers pay for goods and services is the Personal Consumption Expenditures Index (PCE), which is compiled and released by the Commerce Department each month. The most recent data released shows that consumer inflation edged up 2.1% over the past year, marking its largest annual gain since March 2012. A rising PCE is indicative of rising prices for consumers throughout the economy, in other words inflation. One of the Fed’s mandates is to thwart inflationary pressures with gradual increases in short-term rates. This monetary policy tool has been used for decades as it stems inflation and slows consumers down from spending too much before it evolves into inflation. Ironically, even though inflation erodes the buying power of consumers, it is an essential ingredient for healthy economic growth. Inflationary pressures help elevate wages and income, allowing consumers the ability to spend more throughout the economy.